Hazel Olsen collects shells, beads, and driftwood on California's coast for this nature-inspired piece. It's as if the little bird perched at the center of this chime made it herself, gathering shells, beads, and driftwood throughout the day to take back to her studio in the treetops. Close: It's the work of Hazel Olsen, who collects all of the above from the Pacific coast near her studio in Fresno, California. Her nature-inspired chime will stand up in all weather, so hang it to be enjoyed wherever the breeze blows. Handmade in California. As a young mom and teacher, Hazel Olsen had the idea to open a potters studio for her community in Fresno, where adults and kids could take classes, use the equipment, and meet other artists of all levels. She eventually decided one thing was missing: her own work, for sale. It’s now a full collection, available in almost 2,000 shops in North America. Can be used through all weather conditions. My mother loved it! And the fact if was made in California by a local artist was even better. Unusual Design.. Beautiful ... Love It. The bird chime I ordered was beautiful and perfect for my mother's 70th birthday gift. Nice addition to my garden. 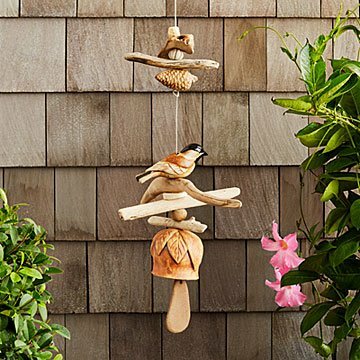 The driftwood and ceramics reminds me of classic chimes from coastal Western communities. Wire is used to keep everything together and should allow this chime to last. Our new house has a sweet little yard. We have several bird feeders outside and this chime is the perfect decoration right outside the kitchen window.